These are exactly the same fonts previously offered by Y&Y, and a license upgrade for Y&Y users who are TUG members is available. The license offered by TUG has slightly more relaxed terms than Y&Y's; most notably, it allows embedding of the fonts in normal PDF documents. The fonts themselves are unchanged. 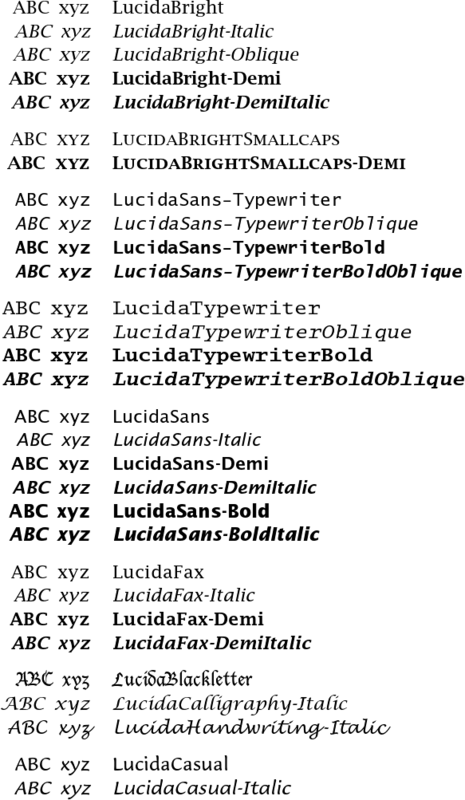 Sample LaTeX documents using Lucida are available, including examples of the math fonts. The image below shows a few characters from each font. Our Type 1 font installation instructions are online if you don't have our welcome email handy. Package documentation for lucidabr (plain text notes on options) and detailed documentation (PDF, with symbol lists and code). To order, please use this online order form for the Lucida fonts, and thanks for supporting TUG. In addition, if you already have the Type 1 font files, the current releases of all support files (TeX metrics and LaTeX package) are available from CTAN. Thanks to Walter Schmidt for creating and updating the TeX font support files for the Type 1 fonts, and PCTeX for sponsoring him and allowing his work to be redistributed. ® Lucida is a trademark of Bigelow & Holmes Inc. registered in the U.S. Patent & Trademark Office and other jurisdictions.